When I sat down to create today's card, I really just wanted to try something different. It sort of evolved as I went along and because what is shown below. I started by cutting my card top, and then cutting another piece the same size out of a piece of scrap. I used my Lots of Labels die to cut out a piece from the center of the scrap, and taped both pieces down to my craft mat - the scrap on top of the card top. I sponged on and blended my inks, coming in from the top left with the So Saffron, and from the bottom right with the blushing bride. Then, I sprayed my hand with some water, and dribbled it on the card. I let that sit to dry for awhile, and then did some splattering with my gold Wink of Stella before removing the mask. I heat embossed my sentiment onto black cardstock, and adhered it to my card front with dimensionals. I then adhered my card front to the card base with more dimensionals. 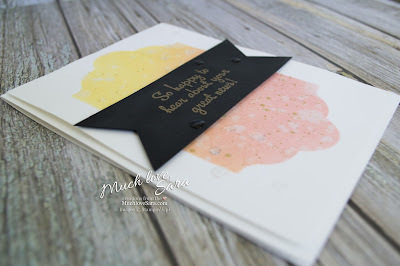 I added a few clear droplets that I had made (I explained how to do this on my Facebook page), and the card was done!